It’s water’s polar nature that allows the salt to dissolve so readily in the first place. Salt, NaCl, is itself polar, with a slight positive charge on the side of the sodium atom and a slight negative charge on the side of the chlorine atom. With water then, the sodium ion readily bonds with an oxygen ion while the chlorine ion readily bonds with the hydrogen. The result is that the salt molecules break up and dissolve into the water. Water‘s polarity allows it to dissolve a wider range of substances than anything else if given enough time. Hence its description as the “universal solvent”. Heat Capacity is a measure of how much energy it takes to raise a substance’s temperature – and water requires a lot of energy, also because of its hydrogen bonding. 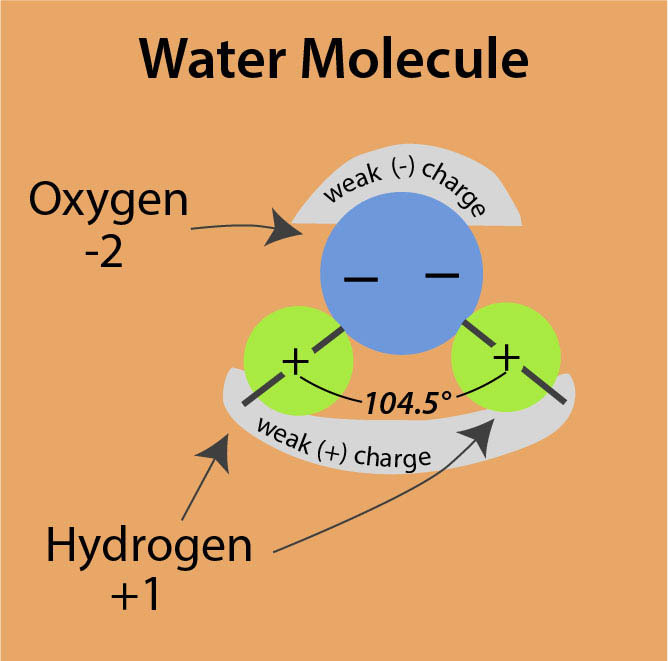 Because the hydrogen bonds keep the water molecules together, energy is required to first break those bonds before individual water molecules can vibrate and create heat. This quality of high heat capacity gives water the ability to buffer large changes in temperature. As a result, coastal areas experience smaller temperature variations than continental interiors. Look at the graph below, showing the much narrower range of high temperatures for Newport, Oregon than for Ontario, Oregon –both of which are at the same latitude. Newport, though, is on the coast, whereas Ontario is inland. Newport, being on the coast, experiences a narrower range of temperatures than Ontario, which is inland. Then there’s water’s tendency to expand when it freezes. We see this phenomenon all the time. In fact, we’re so used to it that we probably don’t give it a second thought. But nearly all other materials shrink and become denser when they freeze. 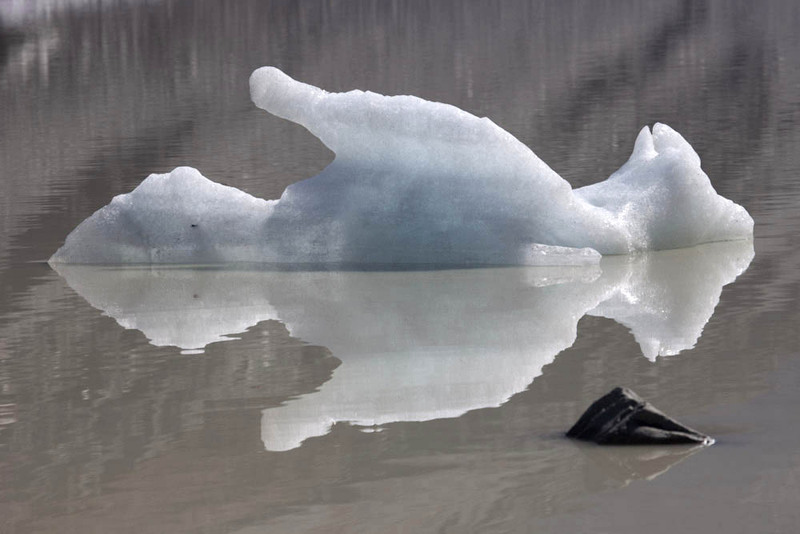 If water did too, lakes would freeze solid in winter and lake-dwelling creatures would die as they became encased in ice! How about rock weathering and erosion? Expansion of freezing water in cracks and soils drives both frost cracking and solifluction, two processes critical to landscapes. The list goes on. This expansion-while-freezing also has to do with hydrogen bonds, as with decreasing temperatures, they become increasingly stable and incorporate freezing water into a hexagonal crystal lattice. These hexagons, while beautiful and symmetrical, are also more open-structured than uncrystalline (liquid) water and so significantly less dense. Of course, there are dozens of other properties specific to water. 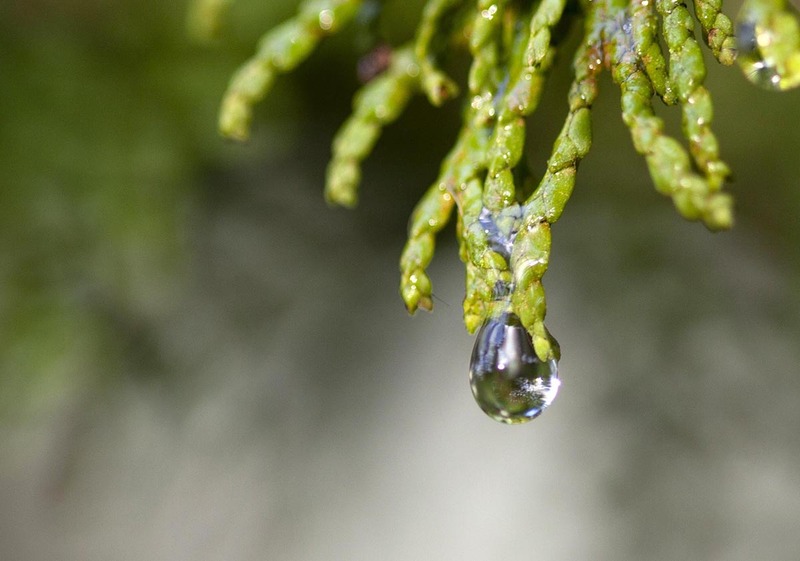 If you’re interested, you can start with the US Geological Survey’s water properties site–the USGS, as usual, gives out a lot of free and delicious information! 1. You have the structure of hexagonal ice wrong. You will find a good description at http://www1.lsbu.ac.uk/water/hexagonal_ice.html The individual molecules do *not* distort, but the structure is open, accounting for the lower density. Note that each oxygen links to 4 other oxygens through hydrgen bridges. This will matter in comment 3. To a good approximation, in solid salt the sodium has a charge of +1 and the chloride a charge of -1; full transfer, not slight. In the solid, there are no “salt molecules” but each Na+ is surrouned by 6 Cl- and vice versa in the familiar cubic NaCl crystal structure. 3. Siica, SiO2, is another material that is less dense at the melting point as a solid rather than as a liquid. The reason is a bit like that for ice; each Si bridges to four others, via equally shared oxygens, just as in ice each oxygen bridges to four others via (partly) shared hydrogens. A consequence for both ice and silica is that the melting point *decreases* at higher pressure. This is relevant to why granite tends to form plutons, whil basalt flows. The silica in granite crystallises out as the melt rises, making the mixture stickier. Basalt, on the other hand, behaves normally; as it rises, the reduced pressure makes it more fluid. Thanks for the comments, Paul –very helpful! I think I probably oversimplified things too much and will modify the post –especially that part about crystallizing into ice. However, I’m not sure I understand what you’re saying about silica. Silica-rich magmas (rhyolitic/granitic) are far more viscous than silica-poor (basaltic) ones, which as I understand it, is the reason why basalt tends to reach the surface more often than rhyolite. It’s not that the silica is crystallizing out of the magma as it rises –in fact, it’s the silica-poor crystals that drop out first, so magmas tend to become more silica-rich as they rise. “Hexagonal” is a misleadng term; it refers to the symmetry of the unit cell, rather than to the presence of actual hexagons.